JEJU ISLAND -- Deepening economic interdependence with North Korea is key to resolving the decades-old nuclear crisis and preventing war, a former unification minister said Tuesday at an international forum on peace and security. “As we are preoccupied with the issue of denuclearization and North Korea’s nuclear weapons, we forget the implications of creating an economic cooperative body among South Korea, North Korea, China and Japan on politics and security in the region,” he said at the session on change and continuity of North Korea. The three-day Jeju Forum, titled “Re-engineering Peace for Asia,” opened Tuesday on the southern island of Jeju, bringing together hundreds of government officials and prominent scholars on Korea from around the world. Through sessions in five categories including peace, prosperity and sustainability, attendees are to delve into the fast-changing diplomatic landscape over North Korea’s commitment to “complete denuclearization” and explore ways to establish a lasting peace regime in the region, following an unprecedented summit between the US and North Korea on June 12. Amid a rare rapprochement in relations between North Korea and the US, South Korea is also preparing to further defuse cross-border tensions and expand inter-Korean exchanges as agreed at the historic inter-Korean summit on April 27. 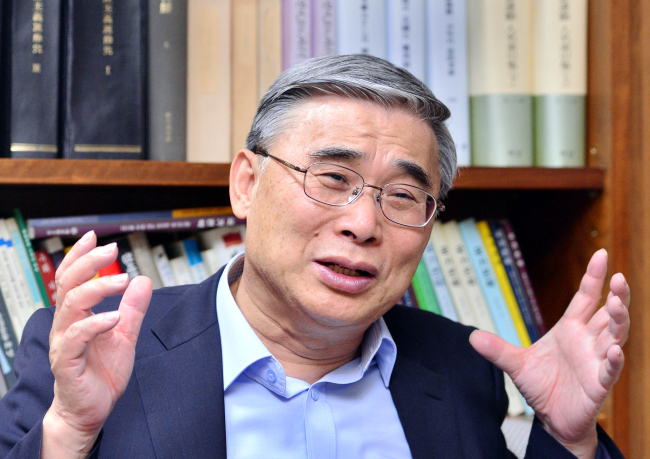 Fellow former Unification Minister Jeong Se-hyun said at the forum that South Korea should move proactively to gain a competitive edge over China and Japan in engaging with North Korea financially in the post-denuclearization era.